Emissions of dust to air can occur during the preparation of the land (e.g. demolition, land clearing, and earth moving), and during construction. Emissions can vary substantially from day to day, depending on the level of activity, the specific operations being undertaken, and the weather conditions. A large proportion of the emissions result from site plant and road vehicles moving over temporary roads and open ground. If mud is allowed to get onto local roads, dust emissions can occur at some distance from the originating site. The scale of these impacts depends on the dust suppression and other mitigation measures applied. In terms of effects, construction sites can give rise to annoyance due to the soiling of surfaces by dust. Very high levels of soiling can also damage plants and affect the diversity of ecosystems. Additionally, there is evidence of major construction sites increasing long term particulate matter (PM10) concentrations and the number of days2 when PM10 concentrations exceed 50µg/m3, the daily limit value for this pollutant. Exposure to PM10 has long been associated with a range of health effects. Local planning authorities often require the air quality impacts of new developments to be assessed as part of the decision making process, either as a standalone document or as part of a wider Environmental Impact Assessment (EIA). The latter requires both the construction and operational phases of developments to be considered, and as a result many stand-alone air quality assessments also consider the impacts of both phases of new developments. In London the Mayor has recently introduced a requirement for construction impact assessments for major developments. 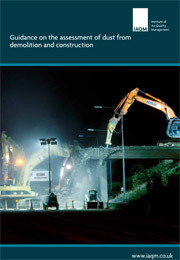 This document is designed to provide guidance for developers, their consultants and environmental health practitioners on how to undertake a construction impact assessment (including demolition and earthworks as appropriate). The construction impact assessment may be a standalone document (possibly including other environmental impacts such as noise) or incorporated into an Air Quality Assessment or EIA. The impacts depend on the mitigation measures adopted. Therefore the emphasis in this document is on classifying the risk of dust impacts from a site, which will then allow mitigation measures commensurate with that risk to be identified.